The Cincinnati Bearcats football program represents the University of Cincinnati in college football. They compete at the NCAA Division I Football Bowl Subdivision level as members of the American Athletic Conference, and have played their home games in historic Nippert Stadium since 1924. As of September 7, 2015, the Bearcats have gone 76–29 since 2007, while also winning five conference titles and earning two BCS Bowl berths in the same span, making them one of college football's fastest-rising programs. They have also earned a bowl berth every year, with only one exception (2010) since the 2006 season. The Bearcat football program is one of the nation's oldest, having fielded a team as early as 1885. In 1888, Cincinnati played Miami University in the first intercollegiate football game held within the state of Ohio. That began a rivalry which today ranks as the eighth-oldest and 11th-longest running in NCAA Division I college football. Sid Gillman, a member of the College and National Football League hall of fame shrines, was the architect of one of the top eras of Cincinnati football history. He directed the Bearcats to three conference titles and a pair of bowl game appearances during his six seasons (1949–54) before leaving for the professional ranks. Cincinnati, with Gillman developing the passing offenses which would make him successful in the pro ranks, became known for its aerial attack in the early 1950s. In 1968, the Bearcats were the nation's top passing team. Quarterback Greg Cook was the NCAA's total offense leader with receiver/kicker Jim O'Brien the national scoring champ. A year later, Cook earned Rookie of the Year honors as a Cincinnati Bengal. Two years later, O'Brien kicked the game-winning field goal for the Baltimore Colts in the Super Bowl. Since its entry into the former Big East Conference in 2005, Cincinnati football has enjoyed a level of extended success unprecedented in program history. The Bearcats have compiled the 10th best cumulative record among all FBS programs dating back to the 2007 season. The program has also either won outright or shared five conference championships in the last seven years and reached a bowl game every year, with only one exception, since 2006. With more than 90 players advancing into the professional ranks, 35 earning All-American honors, and 12 garnering Verizon Academic All-America recognition, Cincinnati football clearly has a history of accomplishments, both on and off the gridiron. The Bearcats have participated in 17 bowl games, with a record of 8–9. For the entire season-by-season results, see List of Cincinnati Bearcats football seasons. Nippert Stadium has been home to the Bearcats football team in rudimentary form since 1901, and as a complete stadium since 1924, making it the fourth oldest playing site and fifth oldest stadium in college football. Nippert has earned a reputation as a tough place to play. One national columnist, visiting the sold-out Keg of Nails rivalry game in 2013, described Nippert Stadium as a "quaint bowl of angry noise sitting under the gaze of remarkable architecture" and went on to compare it to a "baby Death Valley" (referring to LSU's notoriously intimidating Tiger Stadium). In 2012, USA Today called Nippert Stadium the best football venue in what was then the Big East Conference. 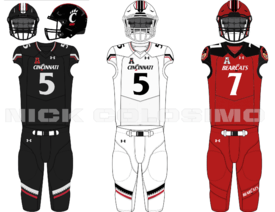 UC boasted a 14-game home winning streak at Nippert, during a stretch dating from 2008-2010. The stadium received an $86 million renovation for the 2015 season, which was completed just in time for the Bearcats home opener on September 5. The Bearcats played their 2014 home games at Paul Brown Stadium. ↑ Overtime rules in college football were introduced in 1996, making ties impossible in the period since. ↑ CollegeGridirons.com. "Nippert Stadium". Retrieved 2010-08-28. ↑ UC Branding Standards (PDF). 2015-07-01. Retrieved 2016-03-24. ↑ Cincinnati Bowl History. Gobearcats.com. Retrieved 13 October 2011. 1 2 Cincinnati Bearcats Index. Sports-Reference.com. Sports Reference LLC. Retrieved 2011-10-11. ↑ Cincinnati Coaching Records. College Football Data Warehouse. Retrieved 13 October 2011. ↑ Year-by-Year Records . Gobearcats.com. Retrieved 12 October 2011. ↑ Whiteside, Kelly (August 25, 2006). "Overtime system still excites coaches". USA Today. Retrieved 2008-09-29. ↑ ncaa.org. "Football Bowl Subdivision Records" (PDF). Retrieved 2015-09-10. ↑ "The Keg of Nails, where getting out is half the battle". December 2013. ↑ "USA Today Names Nippert Stadium Best in Big East". August 2012. ↑ "Cincinnati Bearcats Football Schedules and Future Schedules". FBSchedules.com. fbschedules.com. Retrieved 22 October 2015. ↑ "NFL Players By College - C". ESPN. ESPN.com. Retrieved 16 August 2016. ↑ "CFL Players". CFL. CFL. Retrieved 16 August 2016. Wikimedia Commons has media related to Cincinnati Bearcats football.